I had the good fortune to work with Marie Claire via Redux on a shoot a few months ago where I met the inspirational Tala Raassi. 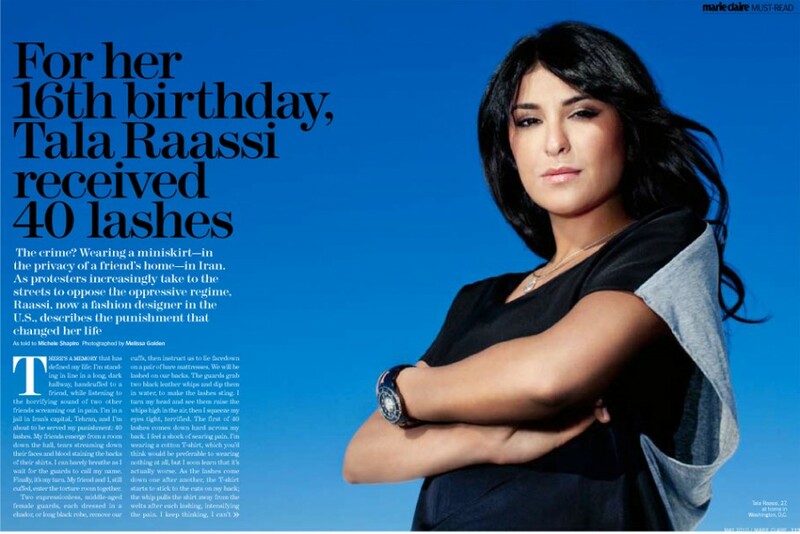 Miss Raassi (as the headline in that glorious doubletruck above says) received 40 lashes for wearing a miniskirt to a private 16th birthday party in her native Iran. She now designs bikinis in America. The degree to which she sticks it to the man, or mullah as it were, damn near brings a tear to my eye. Read the story here. Now I had the misfortune of having to shoot this spread right after snowpocalypse part II dumped a good 5 feet of powder all over the East Coast. I couldn’t get an assistant (note to all assistants: buy snow tires) and I had to go it alone. The immensely patient Tala and I spent 5 hours in and around her studio in Tysons Corner, VA. I was instructed by the editors to shoot her full length against a blue sky. This is for the May issue, mind you, so we drove all over the place to find a patch of open sky in an area full of high rises and leafless trees. I took this one full length to show the futility of my situation. The black specks in the sky are these stupid birds that kept flocking through my frame. Posted on 04/21/2010 10/02/2012 by Melissa Golden. This entry was posted in Marie Claire, On Assignment, Portrait and tagged clips, doubletruck, fashion designer, Marie Claire, On Assignment, Portrait, snow, Snowpocalypse, Tala Raassi, virginia. Bookmark the permalink.